Dorothy Bauer Halloween - Pretty Spooky! Description: Bauer Ghost Pin - If this isn't the ghostest with the mostest, I don't know what is! 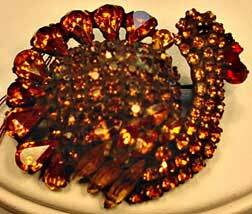 All stones are sparkling clear rhinestones except for two black rhinestone navette eyes. 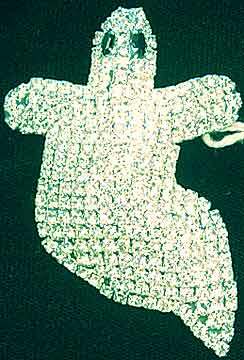 Set in silvertone, this pin has a curved three dimensional body (think Casper) and is about 2.75" from top to bottom and 1.5" at the widest spot. All stones are prong set. Description: Bauer Spider and Web Pin - This imaginative pin features a detachable spider of black and clear rhinestones and goldtone wire legs, attached to a goldtone web completely set with clear rhinestones. All stones are prong-set. About 4" long with the spider; web is a little over 2" at the widest points. Wear the web by itself or attach the spider by its spring-ring clasp. This is the only kind of bug I like (rhinestone!). Description: Bauer Beware Pin - Done in deep red rhinestones and just the right font, set in antiqued brass, this is another great example of Dorothy's ingenuity with a piece you won't find other places (unless they've copied her). 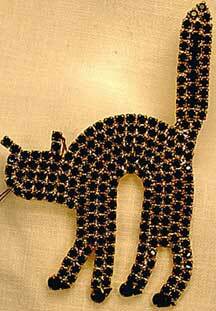 Description: Bauer Scaredy Cat Pin - Whether you like Halloween or just are a cat enthusiast, this black rhinestone cat in goldtone with a bushy tail and hunched back is for you! Approximately 2" x 3" at widest points. 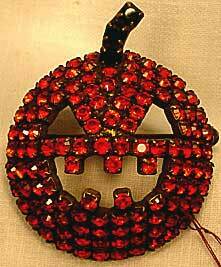 Description: Bauer Three-Dimensional Jack O Lantern Pin - A traditional carved pumpkin look done in hyacinth (orange) rhinestones set in antiqued brass with a black rhinestone stem. Darkness behind eyes is a shadow caused by the depth. Approximately 1 1/2" x 2" by 1/2" (deep). Dorothy Bauer - How about Thanksgiving?? ?